Select theme for birthday party. Don’t forget to keep taste of boy for whom you want to arrange birthday party in mind while selecting theme. You will have to consider age of boy while selecting theme. Another very important point to consider is weather. All party arrangements shall be made according to weather and venue selection. You may plan indoor or outdoor birthday party for your boy. Designing and sending invitations should be your first priority while planning a birthday party. Once you know how many guests are invited and what nature of all guests is, you will find it helpful to make all other arrangements. Prepare a guest list, design birthday invitation according to selected theme and send it with proper information to all guests. If you have decided some dress code for birthday party, then you should design invitation in that design like spiderman’s dress, superman’s dress etc or a simple rocking theme. See samples of invitations in different themes on internet and design your one. If you have selected any superhero theme for birthday party then selecting one color for making decorations would be difficult. So pick colors from the character you have selected as theme and use those colors in decorations like table cover, table centerpiece, banners, cake topper, balloons, napkins and lighting arrangements etc. The real fun of birthday party is in food and games. So be very selective while selecting menu for birthday party for boys. You may order simple sandwiches, cold drinks, spicy food like BBQ, Pizza with fantastic toppings, wings, hot dogs etc. You can ask few of your guests to give ideas about menu so that you do best for majority. Young boys love to play games on computer or play stations so you should arrange a few video games. You can also ask boys to bring their own games CDs. Arranging other sort of indoor games is at your own choice like baseball, soccer etc. You may arrange a visit to some bowling alley to have fun. You can arrange some horror movies or fun movies to watch together and have fun. Don’t miss to arrange music to add to excitement of birthday party. Boys love to have dance in loud rock music. You may ask your guests to bring music CDs with them and make a list of latest movies and select best one for your party. 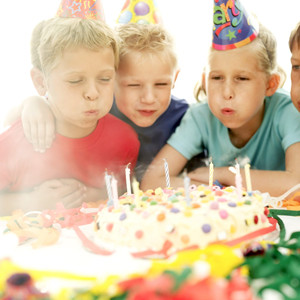 It is hopped that all these ideas will make you arrange a great birthday party for boy.